Although less known in this country, the name of Drakes is synonymous around the world with the most beautiful silk ties that money can buy. 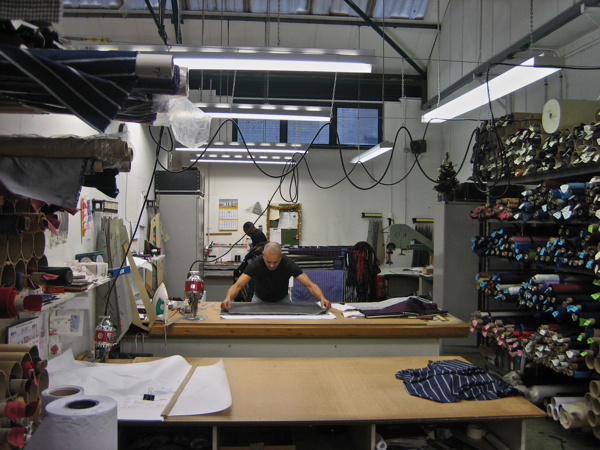 Founded thirty years ago on a top floor in Old Bond St and operating from a former Royal Mail depot in Old St for the past twenty, Drakes brought manufacturing back to the East End at the time everyone else was moving out. Working with companies of silk weavers in East Anglia that were once in Spitalfields centuries ago, the true legacy of the Huguenot weavers is manifest here in the exquisite sophistication of these ties manufactured by Drakes that are prized by the cognoscenti of Italy and Japan. 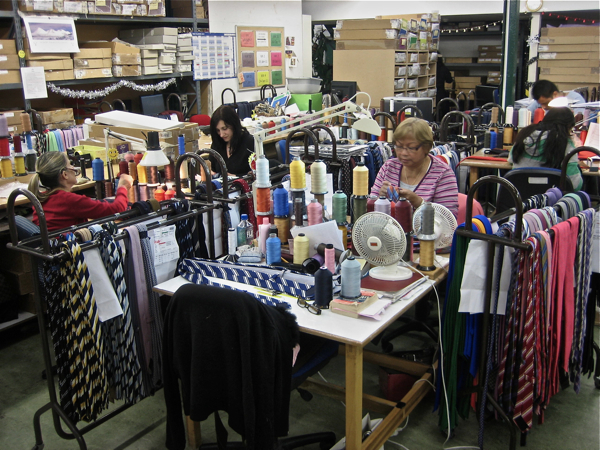 Hidden in an East End backstreet, they are the largest independent producers in this country, supplying conservative English ties to an international market of stylish men who eschew the mere fashionable, and collaborating with Comme des Garcons too. The rich colour of the silks with their subtly woven patterns delight the eye with sensuous pleasure, and it is quite inspirational to step inside from the rainy world of compromise into Drakes’ factory where a small group of skilled tiemakers work fastidiously to create superlative covetable items, sleek and sinuous with a life of their own. At first, the cutters mark out the silk with chalk, placing the patterns upon the bias of the cloth to ensure the perfect hang of the tie, before taking a sharp knife to slice through as many of twenty layers of cloth at once. The blade, the neck and the tail are the three primary parts of a tie. And next, the blade and tail are “tipped” – as it is called when the silk lining is attached. Once tipped and the three pieces sewn together, the tie is “slipped” – meaning, folded around the interlining to achieve its destined shape. Turning the corner from the stillness of the cutters’ workroom, and passing the racks of silks upon rolls, I came into the centre of the factory where amidst a riot of colour – ties of every description and hue, garlanded and draped upon rails – sat those who did the sewing, more precisely known as the “artisan slippers.” When the interlining is tucked into the lining at the tip of the “blade”, the tie can be folded into shape, ensuring the seam is at the centre, and pinned in place. Then, using a curved needle, a loose slip-stitch along its length secures the tie’s shape. 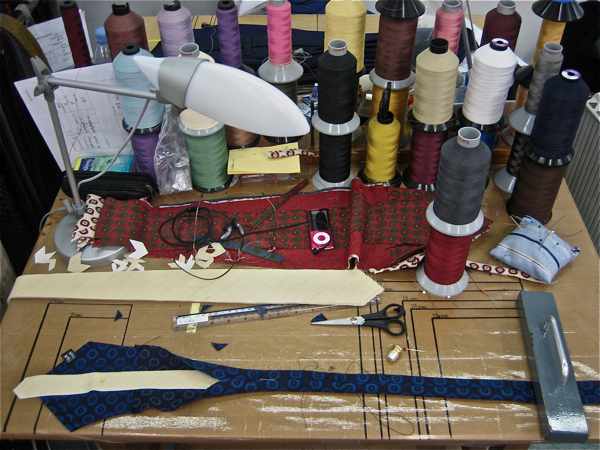 Now, tipped and slipped, with judicious pressings, the finished tie is ready for its label and those pieces of flat cloth have become transformed into an elegant three dimensional form of dynamic grace. On a gantry up above the workroom, I found Michael Drake, bright-eyed and keen, surrounded by swatch books of gorgeous silks and boxes of colourful woolly scarves, preparing to fly to Florence where he will be showing his Winter collection 2011 at the trade exhibition this week in the city’s historic Fortessa, before returning on Saturday and then jetting off to New York for ten days. Part of the continuous cycle of design and sales, involving constant travel, that he has pursued tirelessly since starting the company with partners Jeremy Hull & Isabel Dickson in 1979. “We’ve always made a decent living and we’ve always been successful,” he admitted to me with a sublimely relaxed smile, before revealing with a twinkle in his eye,“But it still is a nightmare. Over the years I’ve had so many sleepless nights.’ For a moment I was disarmed, until he said, “It’s good to worry, the more you worry, the more likely you are to pick up on mistakes before they happen.” Yet, in contradiction to this declaration, Michael still did not look convincingly stressed, rather he looked like a man in his element. “I could do this twenty-four hours a day and never catch up with what needs to be done…” he concluded with an amiable shrug, taking refuge in the former brewmaster’s house next door, which he keeps stocked with the lush art books that are his inspiration and delight. There, as we pored over collections of Mughal miniatures and paintings done by Matisse in Morocco – that Michael consults for ideas for colour combinations for ties – I could appreciate the merging of sensibilities that inform the luxuriously understated aesthetic of Drakes, while Michael explained to me how it all began. When Michael joined Aquascutum, the traditional rainwear company, straight from school, one of the brothers who owned the company took a shine to him, putting Michael on a training programme that sent him to New York and California. He worked in the factory, and even served in the Regent St shop on Saturday to earn extra money. At twenty, Michael was assisting the design director and when he left, Michael stayed on and took over, creating the Aquascutum check still in use today. “I had two company cars in my early twenties,” recalled Michael fondly, with a gleeful smile,“even the accountant didn’t know I’d been given them.” It is apparent that the formative experience Michael had at Aquascutum, of a family-owned clothing company which valued employees and encouraged the transmission of skills, stayed with Michael throughout his career. 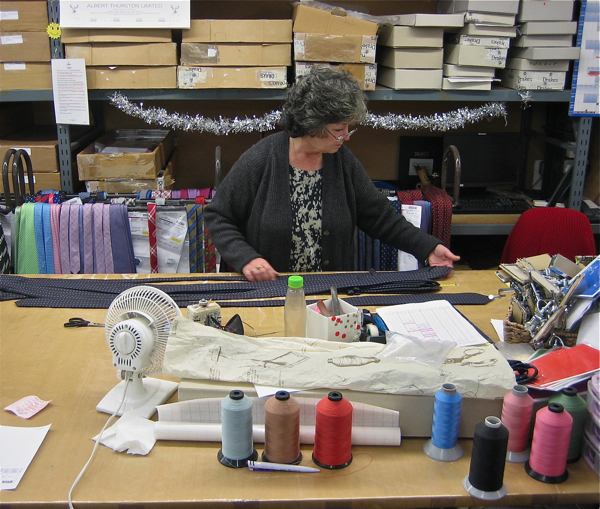 Yet Drakes ties were rarely available in Britain – until they began direct sales from their website two years ago, and received so many orders from customers here that this Spring they are opening a shop in Savile Row. When asked why Drakes’ factory is in the heart of the East End rather than in some soulless business park in Outer London, Michael simply explains that this central location makes it easy for all his staff to get there. 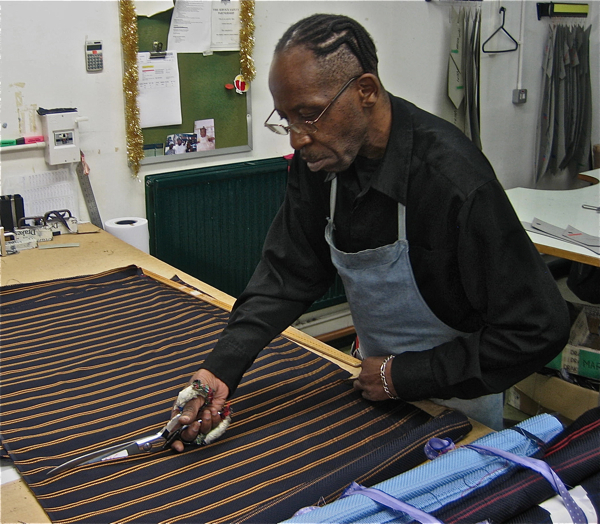 Through imagination, flair and tenacity, Michael Drake has found a way to contradict received wisdom and bring new life to the centuries’ old textile industry of the East End in a way that respects the craft traditions and offers sympathetic conditions to his employees too. And Drakes is thriving, “The only problem we have now is fulfilling all the orders,” he confessed to me, rolling his eyes in pleasure. Marvellous; order coming up! Wish I still needed lots of ties! They really are some of the best silk ties I’ve found – perfect for presents they are so individual and it’s lovely to see them featured here. the tinsel garlanded up in the midst of that riot of color has just about swept me away. happy new year! I agree with Herry, I’d love to give patronage to this true London enterprise, but I hardly need ties now myself, living in hotter climes and being more relaxed in my lifestyle. I can still spread the word though! 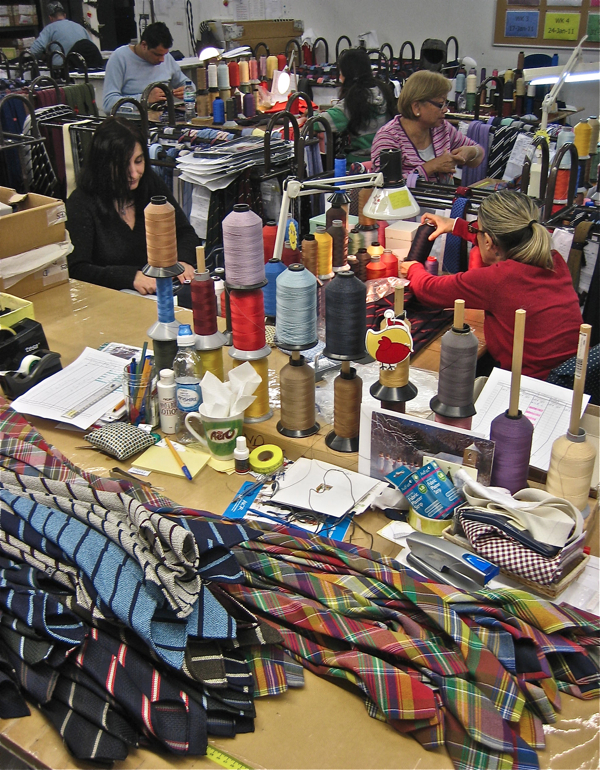 I feel I need to trip down to Drakes’ – one can never have too many tartan ties in my opinion! I review my 15+ year old Drake’s necktie on my site. That piece of finery has had a front row ticket to witness most of my adult life. These are truly unique and long-lasting ties. 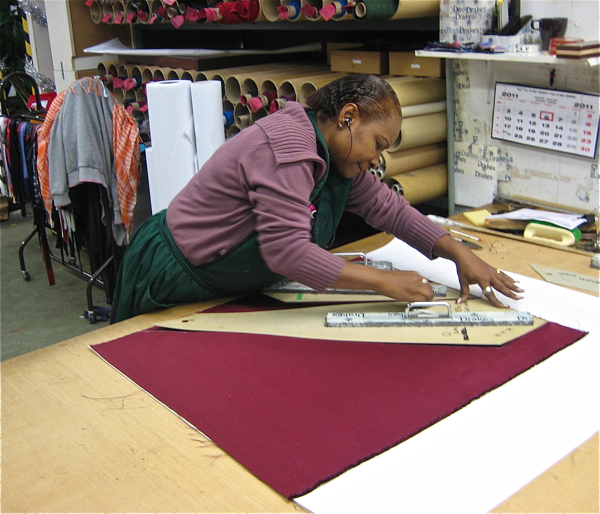 And this is a wonderful article showing the fine men and women who make them. Drakes ties are by far the best!